It has been unusually long between updates. After Zanesville my wife, Kathy, and son, Chris, and I hit the road for three weeks vacation and headed to the northeast. Something we did that most art pottery collectors would find enjoyable was visiting the Roycroft campus in East Aurora, New York. East Aurora is about 15 miles south of Buffalo. If you don't know what "Roycroft" means, you should! Click this link and visit the Roycrofter Home Page. Then click this link and learn about the "Roycroft-artisans-at-large organization." I am pleased to tell you that I am a Roycroft Artisan and am endeared with the Roycroft philosophy and make pots that emulate the Roycroft ideal. Anyway, I took a few pictures in East Aurora that I would like to show you. 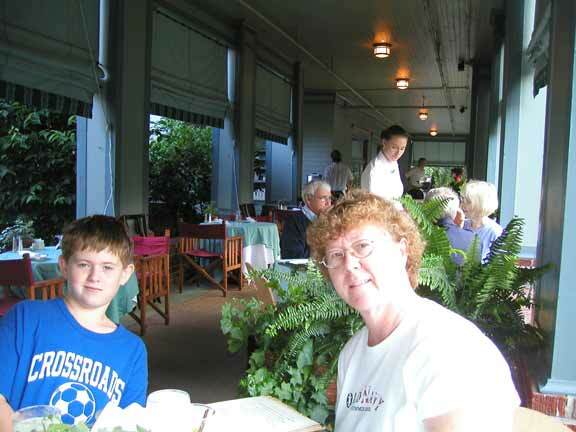 The Roycroft Inn is the focus of a Roycroft visit. It is a wonderful place to put up for a night or two. Wonderful rooms, great food, fine staff- it has got it all. The building recently had a major overhaul and is a prospering business. The rest of the "campus" has not fared so well. The organization was "terminated" in 1938 with the sale of it's assets and now all the buildings have different owners and separate visions. A visit to the Inn is worth the trip regardless. And East Aurora is a pretty town. If you like Arts and Crafts, you will love the the Inn. Here is one of the dining rooms. You can dine outdoors. The food was wonderful- everything on the plate was "special." 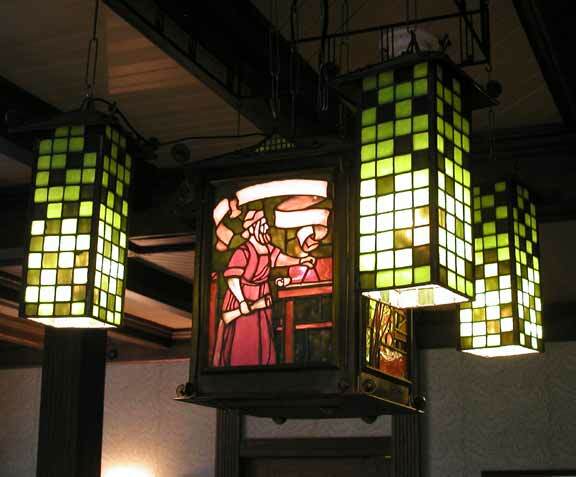 A block's walk from the Inn is the Jewel in the Roycroft Crown- the Elbert Hubbard Roycroft Museum. It's a must-do and see for any Roycrofter, or Arts & Crafts enthusiast for that matter. 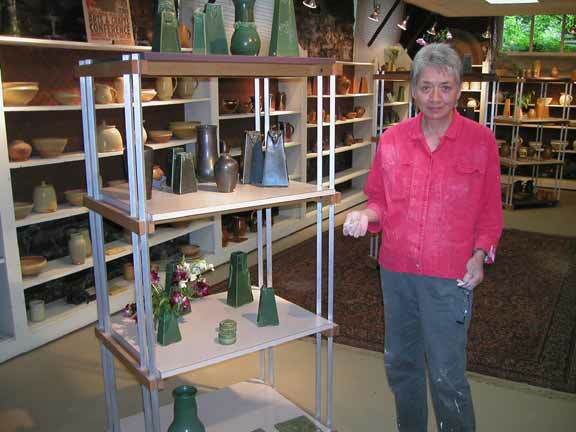 I did visit the local pottery-artisan, , Janice McDuffie and took a few picture of her space that is in a building on the Roycroft campus. After Roycroft it was on to the beach in New Hampshire. 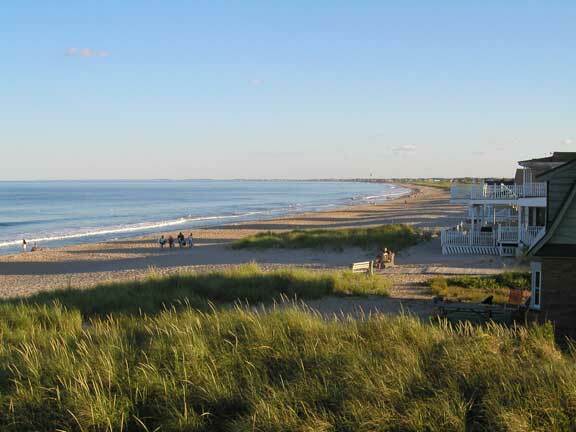 I'll just show you one picture of Seabrook Beach where we stayed for two weeks. 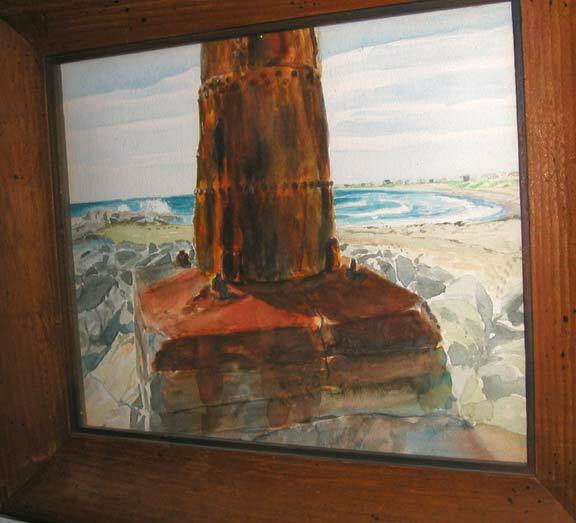 I thought I would do some watercolors on the beach, but I didn't touch a brush. However, I'll show you a couple older pictures from the same beach. and I have to get the fence finished in my backyard along the alley. I figure things should be done in a month, maybe a bit less. I'll be making and posting pots before you know it. I may do a surprize update on the site and post some pots. I was recently rumaging throught my basement and found two boxes of nice old pots that I had forgotten about. I though to myself, "Should I just put these on the web and let them go?" If I do, and this is NOT a promise, I will post them and not announce it. Stay tuned. Frequently.